For years I've been hearing that Martha Stewart's recipe for classic macaroni and cheese is the best, bar none. I prepared it a few days ago, and I might just have to agree. There is a reason why its devotees refer to it as "macaroni and crack." The standard recipe makes waaaaay more than I need so I recalculated it based on half a pound of dry elbow macaroni instead of a full pound. This filled my grandmother's old meatloaf pan perfectly, and I suspect it would have done well in a regular 9x13 Pyrex dish too, although there wouldn't have been enough breadcrumb topping for its larger surface area. The half-recipe appears below. It would serve five or six people as a main dish, easily. In fact, I find this mac and cheese to be so rich, portion control is built right in. I will enjoy the leftovers with something green and healthy on the side. Let me be clear: This stuff is really, really tasty and easy to cook. You make a basic Bechamel sauce and add the grated cheese, which officially turns it into a Mornay sauce. Don't let the fancy terms scare you away because it's dead simple; you just have to stand there and stir for ten minutes while the sauce thickens. Then fold in the spices, the cheeses and the cooked noodles, plop the whole thing into a baking dish, crown it with more delectable yum-factor and heat it through in the oven. The recipe calls for nine ounces of sharp white Cheddar and a smaller quantity of either Gruyere or Pecorino Romano. I used a decent nutty Gruyere and I'm 1,000% pleased with the outcome, but I'm eager to try the Romano version to see how it affects the alchemy of flavors and textures. In the interest of full disclosure, I should tell you that I had to supplement the premium cheese with a tiny bit of Safeway brand ordinary pre-shredded yellow Cheddar that's been in my freezer for weeks. I purchased an eight ounce chunk of the best sharp white Cheddar available in my usual supermarket (Tillamook Vintage White Extra Sharp Cheddar, aged for two years and apparently delightful with wine) and didn't feel like plunking down another $7 for a second big chunk of cheese just to get the ninth ounce needed for the recipe. Now, I'm wondering how it would turn out with lesser cheeses. It's worth a try, but I'm glad I opted for the good stuff this time. Premium cheese packs enough flavor to authoritatively rise above the velvety blanket of white sauce. I was skeptical about using the spices in such tiny amounts -- I tend to overspice -- but I trusted Martha and she was right. Alert diners will easily identify the fragrant nutmeg, while the cayenne pepper whispers, not shouts. If anything, I might use less salt next time, especially if I use premium cheese again. 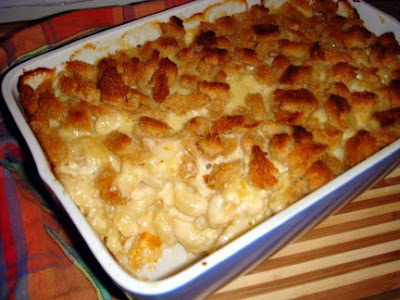 Another small change I'd try is to top it with finer breadcrumbs, and more of them, so they can be enjoyed in each and every bite of delicious mac. If I'd baked this batch in a shallower, wider dish, this amount of crouton-esque "crumbs" would have looked like giant boulders punctuating a moonscape of mac, instead of the generous coating of gentle crunch I prefer. And next time I'll boil the elbows while I stir the sauce instead of waiting until the sauce is finished, so that both the macaroni and cheese components will be piping hot when they merge. My sauce was slightly congealed by the time the pasta was ready, and it didn't flow eagerly inside every noodle, the way I like it. But these are minor quibbles with a near-perfect recipe. I cannot express how yummy this is. Martha, I bow down before you (yet again). I still think my banana bread recipe is better than yours, but your macaroni and cheese is the ne plus ultra. From "Martha Stewart Living Cookbook: The Original Classics"
1. Preheat oven to 375 degrees F. Butter a casserole dish; set aside. 2. Place the bread bits in a bowl. In a small saucepan over low heat, melt 1 Tablespoon butter. Pour melted butter into the bowl with the bread and toss. Set aside. 3. Warm the milk in a saucepan over medium heat. Melt the remaining 3 Tablespoons butter in a high-sided skillet over medium heat. When the butter bubbles, add flour. Cook, stirring, 1 minute. 4. While whisking, slowly add hot milk a little at a time to keep mixture smooth. Continue cooking, whisking constantly, until the mixture bubbles and thickens, 8 to 12 minutes. 5. Remove the pan from the heat. Stir in salt, pepper, nutmeg, cayenne, 1-1/2 cups Cheddar and 3/4 cup Gruyere (or 1/2 cup Romano). Stir well and set aside. 6. Cover a large pot of salted water and bring to a boil. Cook the macaroni until the outside of pasta is cooked and the inside is underdone, about three minutes. Transfer the macaroni to a colander, rinse under cold running water and drain well. Stir the macaroni into the cheese sauce. 7. Pour the mixture into the prepared baking dish. Sprinkle remaining cheese and the breadcrumbs over the top. Bake until golden brown, about 30 minutes. Let set for 5 minutes before serving.